Orange is a popular color again. 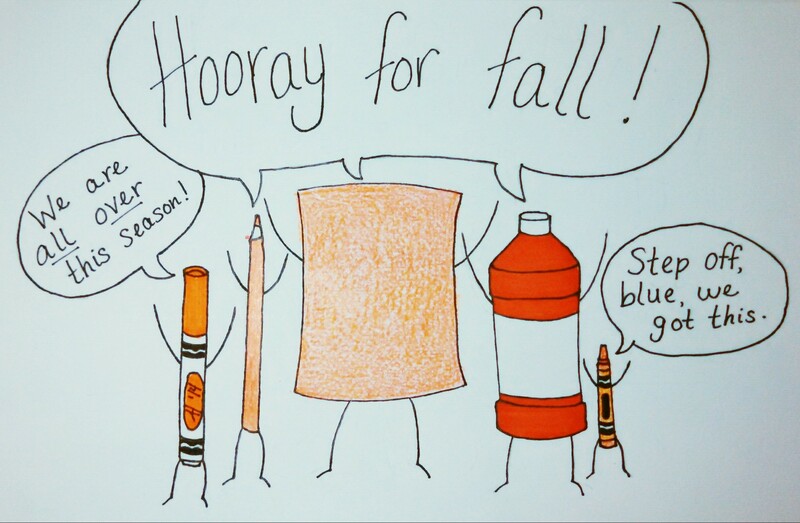 It only happens once a year, so until that first snowflake hits the ground, live it up, orange. This is you time to shine! I have the best art room sign. Ever. One of my classrooms is in a resource room this year. It’s located in a hallway that acts as a pass through from one pod to another, and it rarely gets used. At the beginning of the year, teachers and students were having a hard time finding my room, “is this the art room?” “I don’t know, is it?” “Is she the new art teacher?” “I dunno.” After watching the ninetwentieth person hover outside of my door, unsure, I decided to make a sign. I used what I had on hand, what I had on the table by the door, in fact, and there you have it. 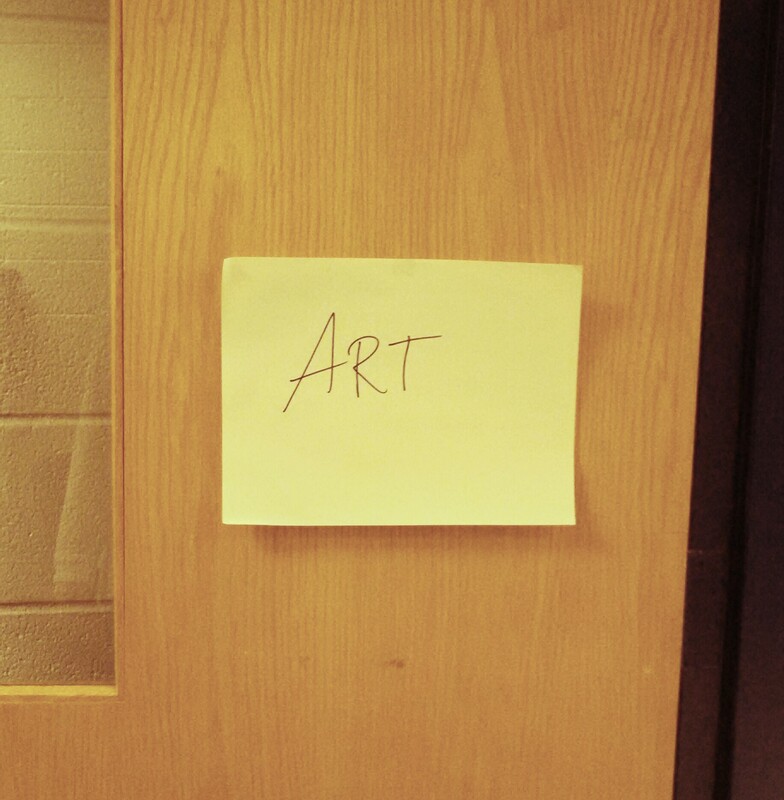 The most beautiful art room door sign you will ever see. And it’s the only thing on my door. I feel like it’s something you might see on a high school math door. I thought about making something nicer, but I just haven’t had the time yet. Plus, I kind of like it now. 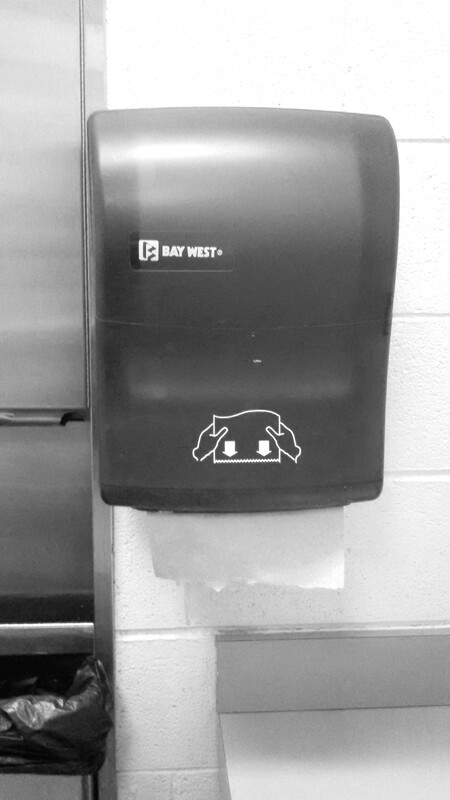 What do you have for paper towel dispensers in your school? We have these, and I think they are the absolute worse. I prefer to snag a roll of towels from the custodians for my classroom, but I still have to use these in the faculty bathroom. Speaking of the faculty bathroom. It took me about three weeks before I realized I had been using the men’s room. In my defense, the sign next to the door just said faculty. It’s not my fault the “men” sign was above the door jam. I only realized my error when I went into the faculty bathroom across the way and noticed the air freshener, container of potpourri, feminine products and pretty smelling soap. In hindsight, I kind of preferred the no-fuss of the men’s room. “A newspaper is what, in a funny show on TV, a dad takes into the bathroom to read while he uses the toilet.” I was so shocked any of them had even heard of newspapers, I just told her she was correct, that’s exactly what a newspaper is for. On a personal note, I’m saddened that my daughter will never experience the joy of carefully removing the funny papers from the Sunday paper and spreading them out on the living room floor. I recently had this exchange with another first grader (always the first graders). we just got those same paper towel dispensers. The old ones where the ones with the individual brown paper towels now we have the rolls. When it was the loose ones the old custodian would give me stacks of extra so he didn’t have to keep coming to refill it all day. The new custodian however.. not so much. He will only let me have the one roll in the dispenser and when I run out in the middle of the day it takes hours for him to come refill it. Which usually means he has to go refill the one in the girls bathroom too because that’s where I send them to get me some when he is taking forever! LOVE the first grader. Totally how all of mine are too!